Yesterday morning I boldly defied the tube strike by marching into Central London for the press launch of this year’s Raindance Film Festival. It was held at Mayfair’s fancy Mayfair Hotel and there was a reasonable supply of free wine. So far, so awesome. A man wearing sunglasses indoors (see above) introduced this year’s line-up, which includes crap-looking Brit animation Jackboots On Whitehall, Iraqi family drama Son Of Babylon and a special invitation-only uncut screening of A Serbian Film. I’ll write more about the programme in due course, promz. 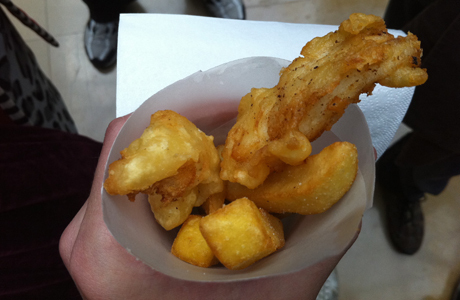 It doesn’t get better than mini fish and chips in a cone. If I sound slightly underwhelmed by the whole experience, it might be because today I’m off to the London Film Festival press launch. I’ll be live-tweeting the line-up as it’s announced so head on over to Twitter if you want to hear about it 15 minutes before HeyUGuys put the press release up. I’ll probably do a post this afternoon detailing the highlights as well, but in all honestly I’ve got quite a lot to do today so don’t blame me if it doesn’t show up until tomorrow.